Now that you’ve read the introduction to my SOBO Starter Guide, it’s time to get into the logistics of it all. Questions like, “When did you start?” or “How do I get to Mount Katahdin?” will be discussed here. Please keep in mind, this guide is based on my personal experience in getting to Baxter State Park. There are many different ways to start a southbound journey and you don’t need to follow this exact process. Though, please let me know if you do! I chose June 15th to begin my southbound hike based on a few factors. I knew I wanted to start in June versus July due to finishing too late in the winter. I figured the black flies and mosquitos in Maine would be bad no matter the month, so choosing based on bugs wasn’t a factor. Then again, the 15th was also a random choosing. I asked my Brooklyn roommate at the time to pick a number between one and thirty and she said 15. There was only one lean-to available at Katahdin Stream Campground on June 15th, so I booked it. Later, when I registered my start date, I noticed the 15th was a popular day and I was excited that I would be starting with other SOBOs. I happened to choose a date with 12 other hikers registered - which is a lot. To assist in choosing a summit day you can view Thru-hiker Registration Charts which show the current number of thru-hikers registered by start date and location. Also join the Facebook SOBO Thru-Hiker Class 2019 to get an idea. For many, the appeal of going southbound is a less-crowded scene. In my experience, this was definitely true yet I found plenty of chances to group with like-minded hikers or hike solo. At the end of the day it’s important to hike your own hike and set your own standards for this journey. 268 Registered Hikers were registered in June 2018, click the chart to see current registrations. The first step is to make a campsite reservation at Baxter State Park at Katahdin Stream Campground (KSC). This reservation is for the night of your summit day AKA where you will sleep after you summit Mount Katahdin. The first day of a SOBO hike climbs Mount Katahdin, a 10-mile 8-10 hour hike. Trust me, you’re not going to want to go much further than KSC campground on your first day. Fellow hikers, Bubbles, Michael, and I shared lean-to #6 and we were exhausted but oh-so-happy. You can reserve up to 4 months in advance. For example, for a June 15th summit day, you can reserve as early as February 15th. I reserved mine on May 5th and there was only one lean-to available on June 15th. The campground is beautifully located at the base of Mount Katahdin and the Appalachian Trail runs right through it (check out the map below!). Everything you bring into the park must be packed out as there are no facilities to leave trash. There are bear hanging cables and composting privies. The ranger’s office sells firewood. This is officially your first night on trail. It doesn’t get much more exciting than this! A map of Katahdin Stream Campground. I stayed in lean-to #6 right next to Katahdin Stream. Please note, most of the lean-tos and campsites in Katahdin Stream Campground have capacity for 4-6 hikers. You can reserve a lean-to then share your date on the Facebook page to see if other hikers want to coordinate with you and split the $32 camp fee (yay new friends!). You will need to list all names on your campsite when you check in with the ranger station that morning. The next step is to register your start date with the Appalachian Trail Conservancy. Not only is this important for keeping good records, but for fellow hikers! The bar graph you viewed earlier, those are hikers that already registered. Great! You chose a K-Day (Katahdin summit day), you registered your hike with the ATC, and you booked a campsite. Depending on how you plan to travel to Maine will inform the next step. I was flying from Newark, New Jersey to Bangor, Maine. Therefore, I needed a shuttle service to bring me to Baxter. 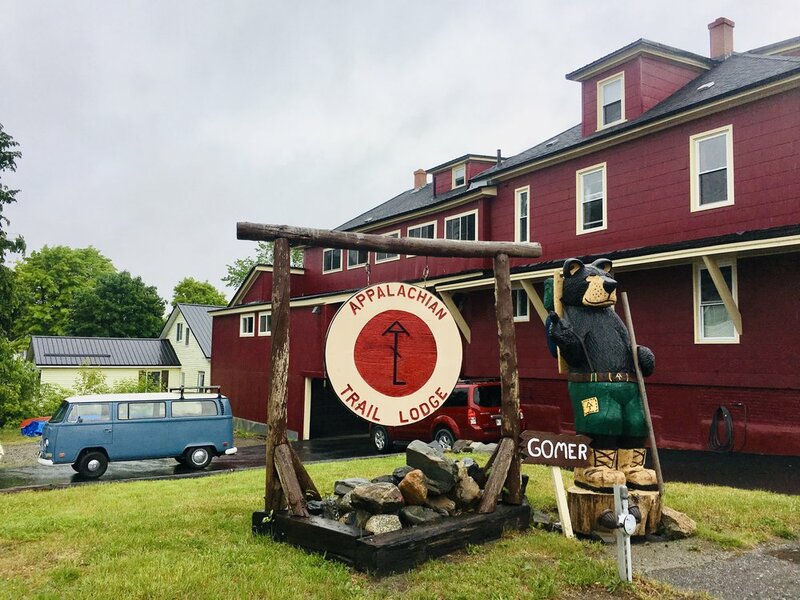 Luckily, the AT Lodge in Millinocket offers a great “SOBO Special” including a night at the hostel and a ride to Baxter the next morning. The one-night SOBO Special costs $70 and is totally worth it. Also, the two-night special at $100 is also worthwhile if you want to give yourself an extra day between travel to settle in. I opted for the two-night special: flying and traveling on June 13th, hanging at the AT Lodge on the 14th, and then summit Katahdin on the 15th. Reserve your night(s) at the AT Lodge online and they will email a confirmation. After you land in Bangor, the bus station is a short drive or walk away. On the plane, I made friends with the guy sitting next to me and told him how I was going to hike the Appalachian Trail. He offered to give me a ride to the bus station and just like that, I got my first hitch! One-way bus tickets are $12 and can be purchased on the Cyr Bus Lines website. The bus leaves the station daily at 6:30pm and arrives in Medway at 7:40pm where you’ll be picked up by the AT Lodge shuttle. There’s a Hannaford Supermarket (with beer! ), McDonald’s, TD Bank, Marshall’s, and other shops within walking distance to the bus station. If you book your flight early enough like I did, you can hang out at the bus station and likely meet fellow SOBOs. I walked over to the Hannaford and met Kevin, another SOBO (later known as Roll Call) while he was packing up his resupply for the 100-Mile Wilderness. I asked if he wanted to check out the Bangor Brewery since we had 5-6 hours to kill. Instead, he suggested we grab beers from Hannaford while we wait for the bus. We had a blast and it was awesome to meet another hiker. Roll Call planned to summit Katahdin the next day while I would go the day after. I wouldn’t see him again until the 100-Mile Wilderness and in Monson, the first trail town. Another thousand miles later and we reunite to hike together in a tramily of seven SOBOs for most of Virginia. The trail has a funny way of bringing hikers together, parting ways, and then randomly coming together again. Keep an open mind on the way to Millinocket and be friendly - you might just meet your future tramily members! Enter Katahdin Stream under “All Campgrounds.” If spaces are full, look at ABOL as well. Steps 1-4 can be tricky since they all rely on availability. Plan in advance and you won’t have any issues. The last thing you want is to book everything but your bus ticket only to find that the bus is sold out or the hostel is full. Again, please keep in mind this guide is one option of many to begin a southbound thru-hike. I found this method easy and fun, as well as convenient and inexpensive. If you decide not to stay at the AT Lodge and utilize their shuttle services, you can stay in an area hotel and have someone drive you into Baxter State Park. I heard of many different scenarios but I liked the social aspect of starting with other SOBOs. After you lock down your travel details and reservations, you’re ready for Mount Katahdin! Please leave any questions or comments below! If you found this information helpful, please share it with a fellow SOBO!